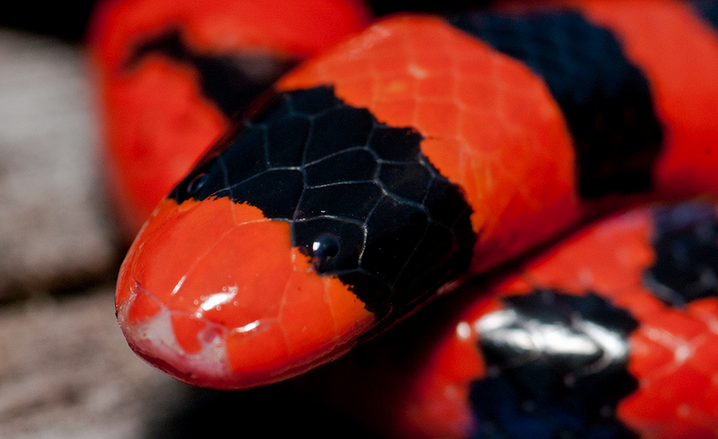 Deep in the Amazon rain forest there lives a fairly small, fairly obscure, red and black snake called Anilius scytale. 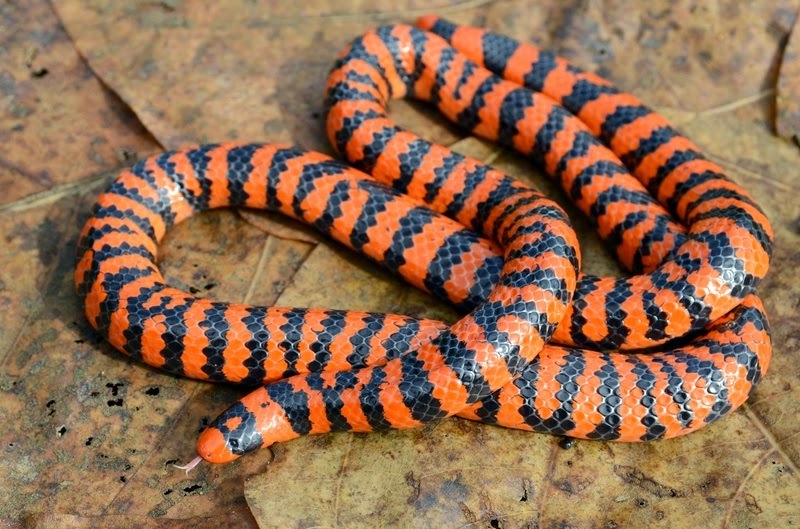 It is banded, like many red and black snakes, but it has no venom, so it may be a coralsnake mimic. It spends most of its time under ground or in the water. Morphologically, it has a mixture of characteristics that place it somewhere in the no-man's-land we call "henophidia"—it has pelvic vestiges like many boas and pythons, but it has a small gape and is not capable of eating large bulky prey. It mostly feeds on elongate vertebrates, including other snakes, amphisbaenians, caecilians, and eels, and like other snake-eating snakes individuals can eat prey approaching their own total length. Its ventral scales are only barely wider than its dorsal scales, and it has just a few enlarged head scales, including one large hexagonal scale covering the eye and the surrounding skin. Males are smaller than females, which are viviparous, capable of giving birth to as many as 24 live young at a time. In 1946, the great naturalist William Beebe wrote "This is a strange snake", meaning that it's not quite like any other snakes. It is alone in its family, Aniliidae. Snake biologists have used the term "pipesnake" to refer to any of three different lineages of snakes: the cylindrophiids (10 species of "Asian pipesnakes"), anomochilids (3 species of "dwarf pipesnakes"), and aniliids (1 species of "red pipesnake"; i.e., Anilius scytale). 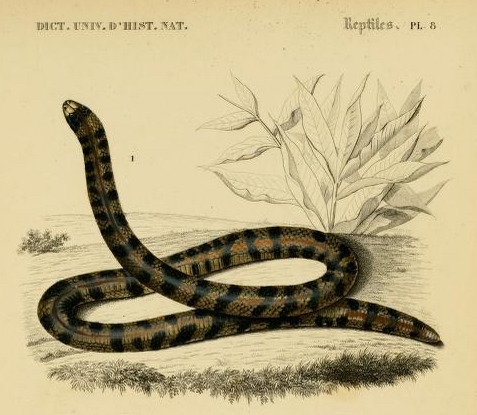 I'd like to propose that we begin to think of Anilius as "the pipesnake that wasn't", because (as I alluded to last month), it is now thought to be most closely related to tropidophiids (aka "the boas that weren't"), superficially boa-like snakes found mostly in the Caribbean. Molecular data and some morphological data, especially that of the soft anatomy of the lungs and reproductive system, suggests that these two groups are each others' closest relatives, and they are now placed together in the Amerophidia (aka Anilioidea), the basal-most lineage of alethinophidia, which was apparently isolated in South America during the split-up of west Gondwana. Details of the skull anatomy cast some doubt on this classification, suggesting a closer relationship between aniliids and other non-macrostomatan pipesnakes, although even if this is true there are undoubtedly deep splits between Anilius and any other living snakes. Like the tuatara and the coelacanth, Anilius has not had close living relatives for tens of millions of years. Only it knows if it's lonely out there on such a long branch of the snake family tree. Like crocodiles, some snakes hatch from eggs. They lay many small ones. 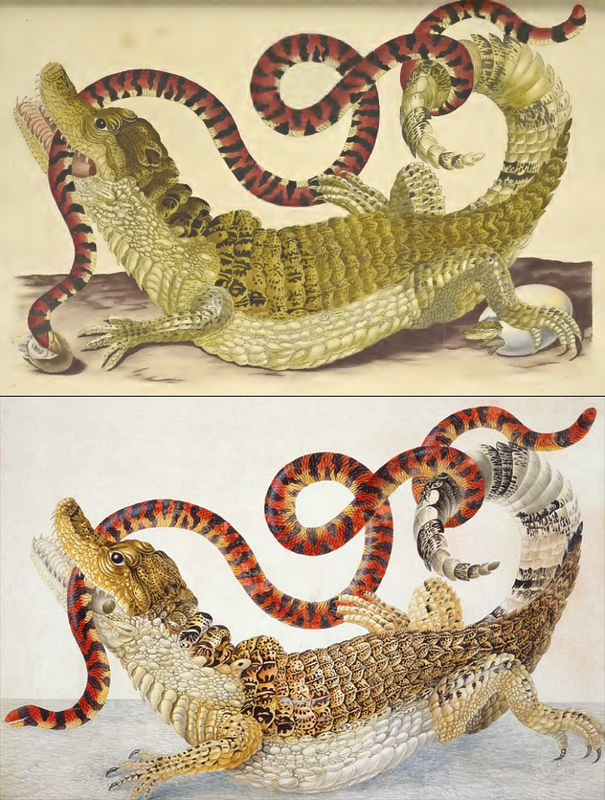 The head and the tail of this snake, the Amphisbona, are the same shape and size, but you can tell which is the head because it has a mouth and small eyes, whereas the tail does not. Of all snakes, this one is the cleanest in color, being black, red, and yellow; others are grayish white, yellow, and brown with bodies that are more flattened. Thanks to Patrick Campbell and Andrew Snyder for allowing me to use their images. Beebe, W. 1946. 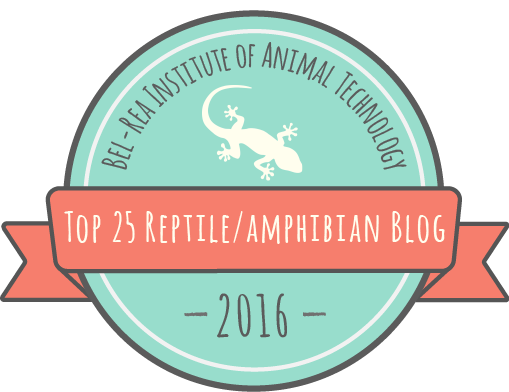 Field notes on the snakes of Karatabo, British Guiana, and Caripito, Venezuela. Zoologica 31:11-52.